The food pyramid had long encouraged kids to eat foods from each of the five food groups each day, but that only worked if you and your kids understood what the food groups actually are. If left up to some kids, the five food groups might end up being candy, chips, cookies, ice cream, and soda. And for some parents looking for quick and easy kid-friendly foods to feed their kids, the five food groups may be pizza, hot dogs, macaroni and cheese, french fries and chicken nuggets. Fortunately, the real five food groups provide a much healthier and balanced diet. Although it has been replaced with the MyPlate logo which advises that we should make half of our plates fruits and vegetables, it doesn't change anything about the food groups. The MyPlate messages, including that you encourage your kids to avoid oversized portions, vary your vegetables, make at least half of your grains whole grains, and drink fat-free or low-fat milk, were all key messages of the food pyramid, too. Grains: Grains, especially whole grains, are good sources of fiber, iron, magnesium, selenium, and several B vitamins, including thiamin, riboflavin, niacin, and folate. Refined grains, such as white bread, white rice, non-whole grain pasta do not have as much fiber as whole grain varieties. Grains include foods made with wheat, rice, oats, cornmeal, and barley, etc., such as bread, pasta, breakfast cereal, popcorn, tortillas, and oatmeal. At least half of the grains your kids eat should be whole grains. Fruits: Most kids like fruits, which are usually a good source of potassium, fiber, vitamin C, and folate. Although 100% fruit juice counts as a fruit in this food group, remember that it is almost always better to eat whole foods. Dairy: This replaces the old milk food group now that calcium-fortified soy milk is in this group. The dairy group is important because it provides kids with calcium, potassium, vitamin D, and protein in their diet. It includes milk, cheese, yogurt, and milk-based desserts, such as ice cream, frozen yogurt, and pudding made with milk. In general, parents should choose low-fat milk products that do not have added sugar. For example, 2% milk would be better than whole milk with chocolate flavoring. 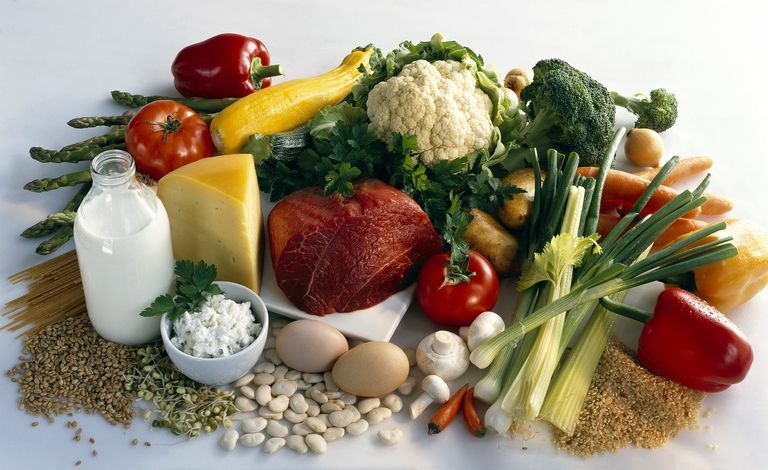 Protein Foods: In addition to meat and dry beans, this food group also includes poultry, fish, eggs, and nuts (including peanut butter), which are usually a good source of protein, iron, vitamin E, zinc, magnesium, and several B vitamins, including niacin, thiamin, riboflavin, and B6. Unless you choose lean or low-fat meat and poultry, food from this food group can also be a source of extra fat. Oils: Although not a real food group, oils and fats are an important part of your diet - both because you need to eat some of them and because you don't want to overdo it. In general, your kids should eat mostly polyunsaturated or monounsaturated oils and fats, avoiding saturated fats, trans fats, and cholesterol. Do you know how to build a healthy eating plan from these five food groups? United States Department of Agriculture. Choose My Plate. Food Groups.